Team Missouri includes students from the Missouri University of Science and Technology and the University of Missouri-Columbia. The Show-Me house features long, horizontal lines that reflect the Missouri landscape. Show-Me House Is "Very Missouri"
Missouri houses are a fixture at the U.S. Department of Energy Solar Decathlon. 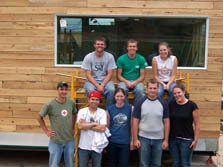 Missouri University of Science and Technology (Missouri S&T) has been a competitor in all four Solar Decathlons. For the 2009 event, the school is partnering with the University of Missouri-Columbia (MU) on the Show-Me House team. Team members call their project a "very Missouri" house. Its long, horizontal lines reflect the state's landscape. The Missouri oak floors and the reclaimed barn wood used in both the furniture and exterior siding recall the state's agricultural heritage. Despite Missouri S&T's past involvement with the Solar Decathlon, all of the current team members are new to the competition. Their decision to form a partnership with MU was based on a determination to broaden the perspective of the project and make the house better represent the entire state. The distance between the Missouri S&T campus in Rolla and the MU campus in Columbia created several challenges. Communication was often limited to conference calls, e-mails, and document exchanges, but the team points out that the collaboration has been effective. "It's really amazing that I can put so much responsibility into my team's hands and things come out so incredibly well. I can't wait to do this in the real world," says Cory Brennan, the project manager and an architecture and civil engineering student at Missouri S&T. The Show-Me House consists of a single module that is 15 by 50 ft (4.6 by 15.3 m). It is capped by a hinged roof, which is roughly 14.5 ft (4.4 m) at its highest point. Structural insulated panels in both the roof and walls provide an impressive R-40 insulation value. The roof supports an 8-kW array of photovoltaic panels, which generate electricity for the house. Also atop the roof is an evacuated-tube solar water heating system for a variety of home uses, including radiant floor heating. "The house itself is very open," says Andrew Adams, a civil engineering student at Missouri S&T. "From the entrance, you can see the kitchen, dining, and living rooms." Designers used natural wood and white walls to increase the feeling of interior space. The Chameleon Home Automation System, designed by the Missouri team, controls the interior environment. Residents program the system with an interface that is accessible via touch screens throughout the house. Sensors within the structure of the house activate heating or air conditioning to ensure indoor comfort. Chameleon can also control humidity, automatically run appliances at the most efficient time of day (solar noon in a solar-powered house), turn lights on and off, and even open and close windows. 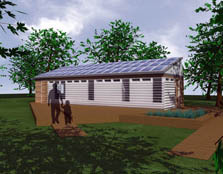 The house was constructed in Rolla, where the previous three Missouri Solar Decathlon houses are on display in the campus Solar Village. After the competition, the Show-Me House will be transported back to Missouri S&T and added to the village, where it will be used for research projects and student housing.